Somewhere in the world right now, it's the perfect time to stretch back on a chaise lounge poolside, a refreshingly colorful drink near at hand and halcyon blue skies blanketing your view. That's why this is the perfect time for Pool Cocktail Escape from TomaTea. Whether you're escaping the weather or just basking in it, this escape-the-room game presents the optimal mix of thinking and relaxing to make your midday break feel like a luxury minibreak. Just point and click your way around, looking for picture tiles, useful objects and clues to solve puzzles until the exit key is found. In this tropical resort setting, you'll discover all the features you appreciate in a TomaTea creation: a glowing cursor to guide you toward active spots, the "I have no clue" messaging to lead you away from unsolvable puzzles, plus the gorgeous atmospheric aesthetics for which TomaTea has come to be known. As for flaws in this superlative environment, besides it being a place you'd rather stay than escape, the navigation is not a smooth turn left or turn right square room situation. So pay attention to how, at only certain angles, you can access areas that earlier seemed inactive, making your way around to a different perspective to look in something seen but out of reach before. You'll encounter many conventional puzzles including color codes, counting, tile collecting and jumbled picture sorting. Although TomaTea tends to be predictable, thus easier for anyone familiar this designer, that means TomaTea can always be relied on for a pleasant escape game experience, one that will take you away from it all, even if only for five minutes at a time. Pool Cocktail Escape Walkthrough now available! When you start out, you're facing a mural of dolphins leaping from the sea. Seal that image in your memory for future reference. Click on the water to dive into the pool. Notice the unusual tile design on the pool's back wall? Did you notice that, when you hover your cursor over the grate, to the right of the pool, it lights up? Zoom in on the grate. Open the paper for a CLUE. Turn to your right to face the lemon tree and two lounge chairs. and pick a LEMON off the tree. Lift up the cushion to find another TILE PIECE (3/9). Before looking at the "puzzle wall" of lockers and towel cubbies, turn around twice to see the umbrella-canopied table. Take TILE PIECE (4/9) from the chair on the right. Ignore the two martini glasses but grab the pousse-cafe (deep, long-stemmed) COCKTAIL GLASS. Pick up TILE PIECE (5/9) by the potted palm. Look at the picture to the left of the gate and make note of what it's showing you. Zoom in on the lockers on the right. Grab TILE PIECE (6/9) from the towel on the middle shelf. Examine the middle locker to the right of the tile picture. There's a left button and right button. Click them in the correct sequence then click the smaller button to unlock the door. The dolphins on this lock are your hint. If you're at the lockers on the right side of the tile picture, you can click the left edge of the screen twice to move left. Here is a 5x5 grid of buttons. Click to select a button and it will darken slightly. Your goal is to create the correct pattern on the grid then click the little gold button to unlock this door. then look under the lid for a clue. Lastly, get TILE PIECE (8/9). From the left side of the lockers, click the right edge of the screen twice to move to the right side of the lockers. The goal is to change the buttons to both the proper color and the correct shape. Then, click the little gold square below to enter the solution. and the last TILE PIECE (9/9). Slide left from the "Colors and Shapes" locker to lay your eyes on the incomplete tile picture. Take the 9 TILE PIECES and place them on the board. Now, arrange the tiles until the picture is complete. To move a tile, click once to select it, then click again on the tile you want to switch it with. From the tiles picture, move left and zoom in on the leftmost locker. One is in the completed tile picture. The other is gained by using the TONGS. Unlock the door by entering the correct 4-letter word. Change the letters by clicking the arrows above or below the letters. Click the smaller button on the bottom to "enter" the word. To get the code to the last locker on the left, you need to make a cocktail. (The last item needed to complete the apertif, a tiny parasol, is obtained by opening this locker). Now, start making the cocktail. 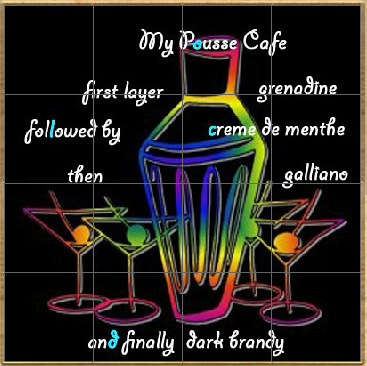 The tile picture provides the recipe. Change each square to the correct color, then click the input button below to unlock the door. Also, take a look at the picture of the cocktail taped inside. Open the LEMON in your inventory and use the KNIFE x2 to cut it into a slice. Then add the STRAW, COCKTAIL PICK and PARASOL. You need a 4-digit number to unlock this door. 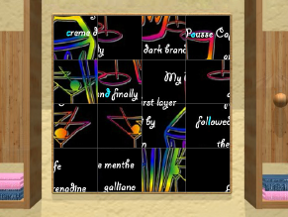 Use the hints from the completed cocktail and from the picture by the lattice gate to figure out the code. Use the KEY to unlock the gate. Great success on your poolside escapade! Is this a recycled Tomatea escape? It seems awfully familiar for some reason. BTW, I don't mean did you guys recycle it, did Tomatea? We didn't recycle it although it is a slightly older game—it somehow escaped being featured by us earlier. Haha I looked at the comments - just to see, it has the feeling of a film I have watched before. Either I'm getting better, or TomaTea made this one slightly easier. Took around 5 minutes. AND Elle beat me... again. Next time, I'm just going to do the escape. Work can wait. looking for the puzzle that the folded towels were a clue for. Sneaky red herring clues! How old is this one! paper hidden in the grate was very tricky and had me stumped for a while! A nice little game, and a great way to take a break from work. @ttyler - that is actually why I remembered this game specifically. That little tidbit was the only part that I had to turn to the walkthrough on. It's actually a july 2011 game, and I'm pretty sure it was on JiG, although it's not in the archives anymore. Apparently the designers didn't come up with anything new this week. There's a weird tan and orange bar across the bottom for me that's partially covering the two buttons on the bottom right. Could you try loading the game in a different browser to see if that helps? I don't have that capability from here, but I now know that it's the loading bar which didn't properly clear off. And if I refresh the page the bar goes away the second time. I think I played it before as an attached link. I don't know if it is just me, but there have been quite a few games on this website that when they open in the Casual Gameplay page, you can't see parts of the game that you need to see - I have used two different computers and three different browsers, so I know the problem is not just mine. Any way to fix that guys? Every time I have seen this complaint in the past it has been due to the player's browser being "zoomed". Flash games don't usually display properly with a zoomed in browser, thereby cutting off parts of the game window. To reset the browser, try the "View" menu, then select appropriate option to Zoom the view to Actual Size, or Reset. On Mac OS X it's CMD-0 (command-zero). Try CTRL-0 if on Windows. Got it...with no help! Not always so fortunate! Pretty straightforward. Tomatea does it again. However, I didn't need one of the clues for one of the doors, but it made me go find the clue before opening the door.